Welcome September and hello everyone!! We are back after an amazing eight days spent in two gorgeous Greek islands: Santorini & Folegandros! Do you remember the amazing surprise trip organised by my fiancé, now husband, last year in Santorini? Well, this year was just as goooood! I love Santorini so much and this time I was there photographing an intimate Chinese Destination Wedding in Firostefani, a picturesque village overlooking the caldera in Santorini. Needless to say it was a dream location, the couple chose the luxury Sun Rocks boutique hotel to celebrate their love, together with 21 guests. This stylish wedding was superbly organised by the team of Stella & Moscha and could not have been more perfect. I cannot wait to show you their gorgeous wedding in the next few weeks, here on the blog. I’m just so thrilled to travel back to Greece next summer for further destination weddings!! If you are looking for your Wedding Photographer in Greece, get in touch with me here! I’m often in Greece and I can’t wait to hear all about you and your other half and about your dream destination wedding in Greece. Let’s start planning!!! Anyway… today I actually wanted to focus on the first part of our trip. In fact, as soon as we landed in Santorini, we caught a 40 minutes speed boat to another Greek paradise island, the gorgeous Folegandros. The plan was very simple, we wanted to relax at the beach, enjoy the superb Greek food and culture, explore the island and just chill out before shooting the intimate destination wedding in Santorini! And let’s admit it, I was also ‘studying’ Greek with my half Greek husband! (I did failed miserably by the way). 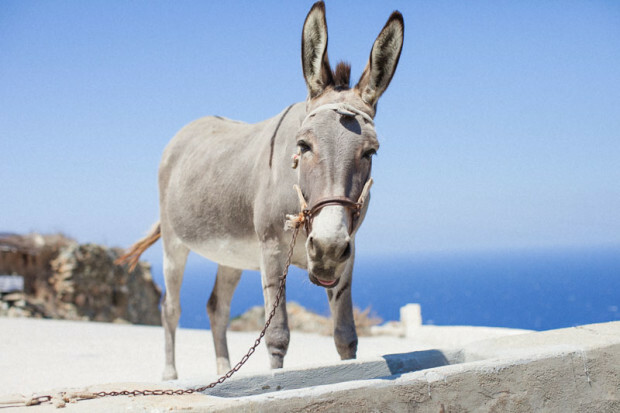 Folegandros is one of the best kept secret in Greece. Not many people have heard or visited this tiny and unspoilt island, which is only 13km long and 4km wide. Everything in this island seems to have come out of a Greek fairy tale! Its capital, called Chora, has been described as one of the prettiest village in Greece and let me tell you, I still haven’t been anywhere more picturesque!! It’s a photographer’s dream. It’s perched on cliffs 300 meters above the sea, it’s just so cute and adorable that I guarantee you, you will go house hunting the moment you take a stroll in it. The Chora is full of greek tavernas and bakeries, you can’t ask for more if you want to dig into the Greek food culture. You won’t see many people during the day, which makes it perfect for photographers, but at night, it lights up and everyone is eating outside in the tavernas and restaurants listening to Greek music or wandering in its squares, alleys or at the Kastro, the medieval area. Folegandros will just enchant you, I promise. And if you don’t believe me, take a look at the pictures below and start planning your romantic adventure in Greece. 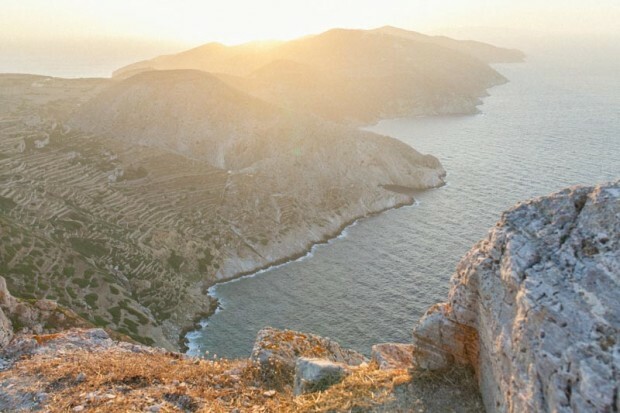 When in Folegandros, a must do romantic experience is catching the sunset from the peaceful Church of Panagia located on the hill above Chora, gloriously overlooking the island and the sea. In about 15 minutes walk, you reach the Church via a zig zag path from the Chora. You might want to bring some water with you though, and then completely relax gazing at the beauty in front of you. Folegandros is not a party island at all, your goal there is to recharge your batteries and relax. There isn’t much to do there! During the day, you can either rent a car (like we did) or a scooter and go beach hopping to the numerous small beaches that are spread throughout the island. You can also walk if you are up to, or wait for some busses to come along. Bear in mind that the beaches are NOT organised. It’s highly recommended to bring an umbrella, lots of water and some food with you! We usually stopped every morning at the bakery to get some fresh spanakopita and tiropita on our way to the beach (spinach and cheese pies). The most popular beach is definitely Angali, which means the ‘hug’ located just 5km west from Chora. From here, you can take little fishing boats departing every 20 minutes or so, at least in August, that take you to two further beaches: Agios Nikolaos (approx. 10 minutes), my personal favourite, or to the more remote and secluded Livadaki (approx. 25 minutes). Livadaki is a really tiny bay, literally hidden between the cliffs and the rocks. There is nothing there, nothing at all, so drinks, food and umbrellas are a must. If you forget your umbrella, you can always get some shades under the many tamarisk trees. If you prefer pebble beaches you can also spend few hours in Karavostassi, near the harbour or Livadi. For the more advernturous, you can check out Agios Georgios, on the northern part of the island. Bear in mind you can’t reach this beach by car or bus. Either you walk down in one of the many paths or you try reaching it with a scooter. We weren’t able to visit this beach during our stay due to the very strong wind. In Chora we loved the tavernas called Piatsa and O Kritikos, which are located in the main two squares, you can’t miss it. O Kritikos is actually situated in my favourite Folegandros spot! Not to miss the bakery in front of the restaurant To Spitiko for your morning breakfast with greek coffee and apples pie or for your takeaway lunch with spanakopita & tiropita (spinach and cheese pies). 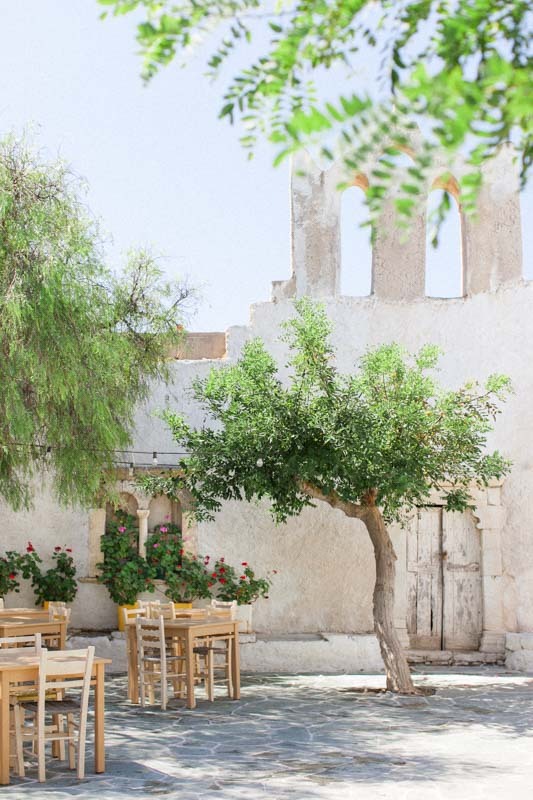 In Ano Meria we loved the taverna Mimi’s, run by a local family and known for its matsata! You will recognise this place as it always shows fresh octopus outside his taverna. Don’t miss the typical local Matsata (taglietelle with lamb or beef) although, I have to say, for us Italians this just taste as VERY overcooked tagliatelle! :) and rakomelo (raki and honey shots). Chora & Kastro, the Church of Panagia at sunset, drive though the island (there is just one street) and explore its beaches and the other two small villages, Ano Meria and Karavostassi. We loved our hotel!! We stayed at Kallisti Hotel, just a two minute walk from the Chora. We loved our room with a small terrace overlooking the Panagia (perfect spot for breakfast) and how cleaned it was!! – and MIAMI & the KEY ISLANDS. Happy travelling!!! And if you’re looking for your Destination Wedding Photographer for your dreamy wedding or elopement, you know where to find me :) I’m always available to travel and document your love story!! My Wedding Portfolio is available here! Don’t forget to sign up to my newsletter – I share exclusive offers & tips with readers so make sure you don’t miss out! So lovely! Looks like an amazing place to visit, love the colours.